A careful balance between ensuring passenger safety, reliability and protecting lineside wildlife and trees is at the core of the independent Vegetation Management Review undertaken for the government, Rail Minister Andrew Jones revealed today (28 November 2018). His comments came on a visit with review author John Varley to the launch of the first British railway hedge planting trial at Hadley Wood, by Network Rail, the Tree Council, and Hadley Wood Association and Rail User Group in Hertfordshire. Mr Varley, an experienced land manager, sets out a number of recommendations for Network Rail to revamp its lineside operations across the network. They include calling on the Department for Transport to set out clear expectations for Network Rail, and for the organisation to implement a cultural change focused on valuing nature and the environment as well as improving communication with affected communities. Network Rail is the one of the largest landowners in the UK. Last year there were an estimated 1,500 incidents of rail disruption due to trees and bad weather. Over the next 6 months Network Rail will develop a plan to address the recommendations. This includes a commitment to improving the way it operates to better protect nesting birds, before next year’s nesting season. "This is a positive report and I welcome it. The thousands of miles of lineside vegetation and wildlife on our rail network are valuable assets which need protection because of the environmental benefits they bring. "So I completely understand people’s concerns when they see trees being cut down, but it’s also important to recognise that without effective lineside vegetation management we risk delays and compromise safety for passengers. "Network Rail already demonstrates good practice in many locations but it is vital this is mirrored across the network, which is why I have asked the organisation to put together a plan which addresses these issues in the next 6 months. This is about culture change across the organisation as a whole." "The profile of today’s line-side vegetation is a product of the evolution of the railway over decades. If laid out end to end it would stretch over halfway around the circumference of the earth. "This is a valuable and nationally important natural asset. Taken together, my review’s recommendations should lead to a significant improvement in the environmental impact of the railway, while reducing cost, and safety and performance risks. "The time is right for Network Rail to not only be one of the safest railways in Europe, but the greenest too, by valuing nature and providing a railway for people and wildlife." "I welcome the Varley Review, in particular the opportunity it gives Network Rail to develop an ambitious vision for increasing biodiversity on the railway. Over the next 6 months we will develop a costed plan to deliver the aims and recommendations of this report. We will also improve the way we operate to better protect nesting birds, ready for next year’s breeding season. "We are grateful to John and the team for their vision, insight and guidance." "The Network Rail estate is an important national asset for biodiversity, providing vital connections for wildlife throughout the landscape. 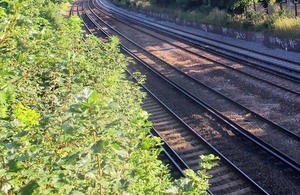 The RSPB commends the recommendations in this review as the right ones to resolve the issue of vegetation management in the bird nesting season, and, enable Network Rail to deliver a positive approach to environmental management that enhances the estate’s biodiversity, natural capital and provides a safe railway." The Department for Transport accepts the recommendation for government.